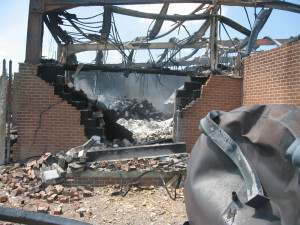 Hazardous materials, whether in a raw state or the finished product, are capable of producing a wide range of physical damage – from fires and explosions to health problems and, in some cases, even death. Alongside classification, you’ll also need to quantify the amount you’re storing on site – do this for each type of chemical. Then, record the number of different sizes and types of containers that hold your hazardous materials. The safe handling and storage of hazardous materials is one of the most important tasks for the protection of the health of employees. The employer has many responsibilities and must be aware of the potential hazards different materials contain. It’s critical that you request information on relevant government legislation and regulations for the safe storage of your hazardous materials on site. The HSE and other government organisations are there to help ensure that environmental health and safety risks are minimised as far as reasonably practicable in industrial organisations, so don’t be afraid to ask what you need to do to become compliant. One of Chemstore’s team can talk you through the necessary steps and provide expert advice to ensure you are compliant. One of our engineers can issue you with a full site proposal with the relevant advice, products and services to enable your site compliance for the safe storage of hazardous materials. The Chemstore team provides a full after sale service to inspect and maintain all products to ensure the highest standards are upheld. Request your free site assessment and expert hazardous material storage solutions from an experienced Chemstore engineer today. Call 020 8704 1807 or email us. Many companies use hazardous chemicals in their production, manufacturing and maintenance processes. These companies must be sure to implement control measures to reduce the risk of harm to employees. First of all, wherever possible the need for the hazardous chemical should be removed from the process. If this is not practical then it may be possible to source a less hazardous alternative. At this stage of selecting a new product, a thorough analysis of the material safety data sheet (SDS) is required, now although the quality of SDS has improved greatly in recent years, they may not be 100% accurate. The manufacturer may have changed the ingredients of a chemical without updating the SDS and of course there is room for human error. It is advisable to conduct a controlled trial of the product to ensure that it does not introduce any new hazards and does the job that it is supposed to. This is where your operatives are worth their weight in gold as they alone can comment on the impact this change will have on their day to day productivity. Safety representatives, manager, engineers should also be consulted to ensure no oversights are made. Staff who are required to work with, or are exposed to the hazardous chemical should receive training on how to work with the product safely and should know the risk factors involved in doing so. Emergency response teams must be trained and on standby to deal with any problems as they occur. Their standard procedures must be supported by emergency response plans which should be updated through regular testing of simulated incident. What is often forgotten in daily handling is the improper storage of product or material. Hazardous materials are therefore always a current topic for every laboratory. Apart from the proper handling strict storage regulations must be observed. The current storage cabinets provide local storage close to the workplace similar to cabinets shown below. The final resort in controlling hazardous chemicals is the use of personal protective equipment (PPE) such as protective gloves, goggles and ventilation masks to shield the wearer from the ill effects of any chemicals they are working with. If you require information on Training, PPE and our full range of EN14470-1 compliant cabinets please do not hesitate to call any of our Sales Team on 020 8 704 1807. The following acts as a brief reference guide to your acid storage. Inorganic also known as mineral, the most common are Hydrochloric, Sulphuric and Nitric acids. Organic acids for example, Acetic acid being the most common. Flammable acid, the only common example is Acetic acid. 2. Acids are frequently supplied as aqueous solutions. For example, the higher the concentration of an acid the greater the potential of fumes, which in turn can be very corrosive. 3. Always refer to the Material Safety Data Sheet which gives directions regarding storage and handling advice. Acids must be separated from other chemical types such as bases. 4. 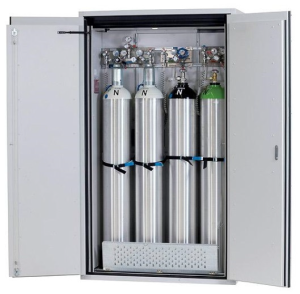 Having established the nature and quantity of acids present, and measured available storage space, you are now in a position to recommend specific asecos cabinets. Where acids are mildly corrosive the CS Line can be considered, but as they contain some metal components corrosion resistance is limited. For stronger acids use the SL Line which is highly recommended. In both cases extraction is recommended. Where segregation is required there are a number of products which may be considered such as the SL, CS or K Lines. 5. Check the client requirements for interior furniture within the cabinet, this depends on the size and number of containers being stored. With respect to storing acids if possible always recommend PE coated shelves or plastic pull out drawers if available, it helps reduce the risk of corrosion to those components. 6. 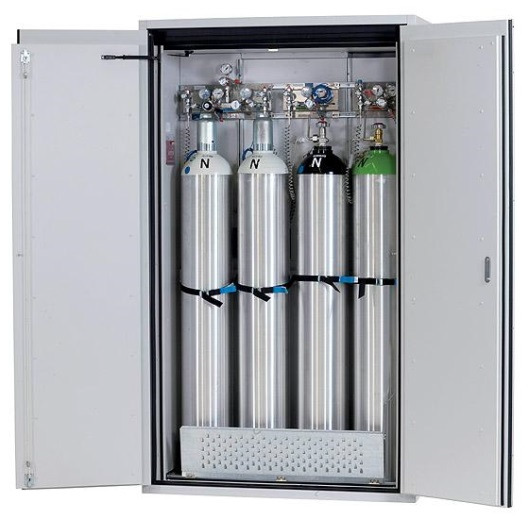 We advise that in all cases cabinets are to be ventilated where acids are stored, acidic fumes are corrosive, so for example non-metallic components are to be used in the extraction hosing. In 2014 asecos are releasing a recirculating UFA extractor for acid fumes as an option. 7. Establish where the cabinet is to be delivered to, either to point of use to behind first door (goods-in). The identification of hazards, evaluation of their risks and putting in place of control measures to secure the health and safety of employees is a major element for managing health and safety under the Safety, Health and Welfare at Work Act, 2005. The Chemical Agent Regulations 2001 point out the specific requirements necessary to complete a Chemical Agents risk assessment of the chemical agents used in the work place. Consider who might be affected and how they might be harmed. Evaluate the risks. What are you doing now and what further precautions are needed? Document and implement your findings. Update and review as required. The first step in risk assessment is to identify the chemical hazards. When recording all potential chemical hazards, look beyond the obvious. As well as considering the use of chemical agents, look at chemicals or substances that may be produced by a process, for example welding fumes etc. 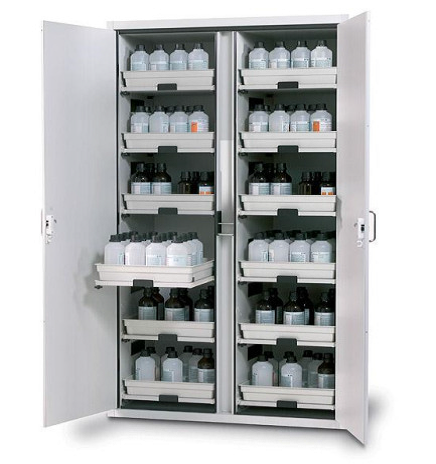 Evaluate the correct storage and the quantities of chemicals being stored as well as waste disposal. Consider all materials, preparations/mixtures. Besides chemical agents, consider also, for example, items like glues, materials used by maintenance such as oils, gardening materials, water treatment and cleaning materials. Check to see whether any of your chemicals are subjected to any Restrictions or Authorisations under the REACH Regulation. Your chemical supplier can supply you with this information and must supply you with a safety data sheet, (SDS) which should be provided with each material. The SDS is a primary source of health and safety information. For example the SDS may have your use included in the attached exposure scenarios (ES). It will include occupational exposure limits where they exist or it may have derived no effect levels (DNELs). The second step is to consider who (groups of employees) might be affected and how the material/chemical might harm them. Recognise that some employees may need special consideration, for example, language needs of non-national workers, potential exposure of pregnant employees etc. 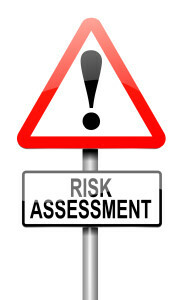 While the employer is responsible for carrying out the risk assessment, employees should be involved. The fourth step is to document and implement your findings. Write down your findings and discuss them with your employees. Consultation with your employees is necessary at every step and especially when implementing the findings of your chemicals risk assessment. Use this template to draw up an action plan, detailing who is responsible, for what action and when will it be carried out. 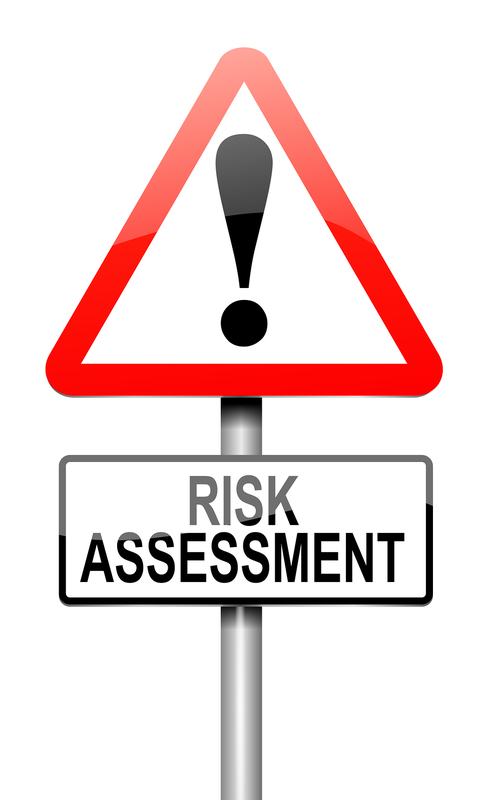 As no workplace remains the same, the fifth step is to review your risk assessment at least once per year, and update if necessary. When changes such as new employees, machinery, equipment or materials occur in the workplace it is necessary to review the risk assessment. Change in work patterns such as overtime or shift work, the needs of pregnant/nursing employees and those with special needs must also be included. When you are finished, check with your chemical supplier to ensure that your use of the chemical is recorded in the Exposure Scenarios part of the Safety Data Sheet which is now required under the REACH Regulation. 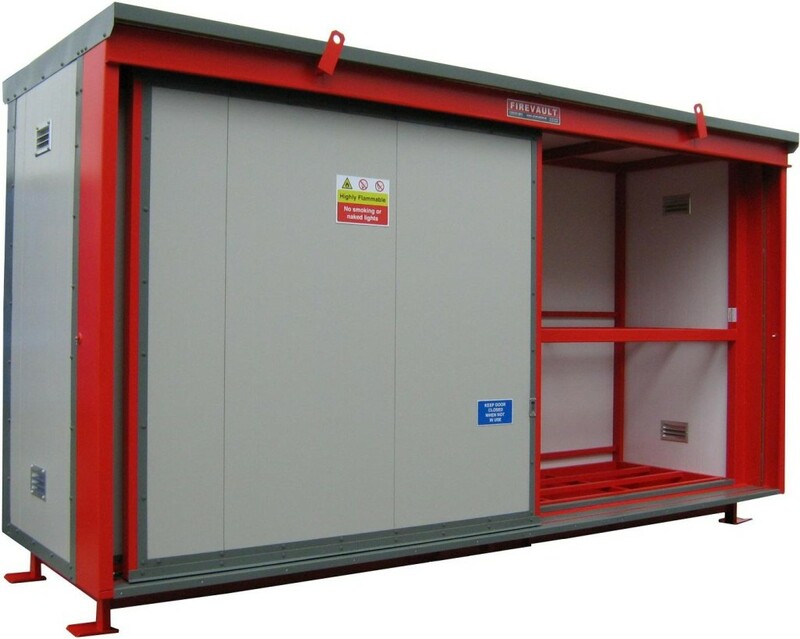 Since 1993 we have been designing & building a comprehensive range of stores for all types of storage and dispensing solutions for Hazardous Materials. We have recently been made aware that there are numerous products on the market which are not compliant or fit for purpose. The pictures below show findings following Free Site Audits conducted on 2 separate sites recently. Pictured left is an 8 pallet store which was built around standard warehouse pallet racking and using heavy Insulated paneling. The weight which was being exerted on the framework could not withstand the load bearing pressure and this led to the unit being blown over in the recent strong winds. 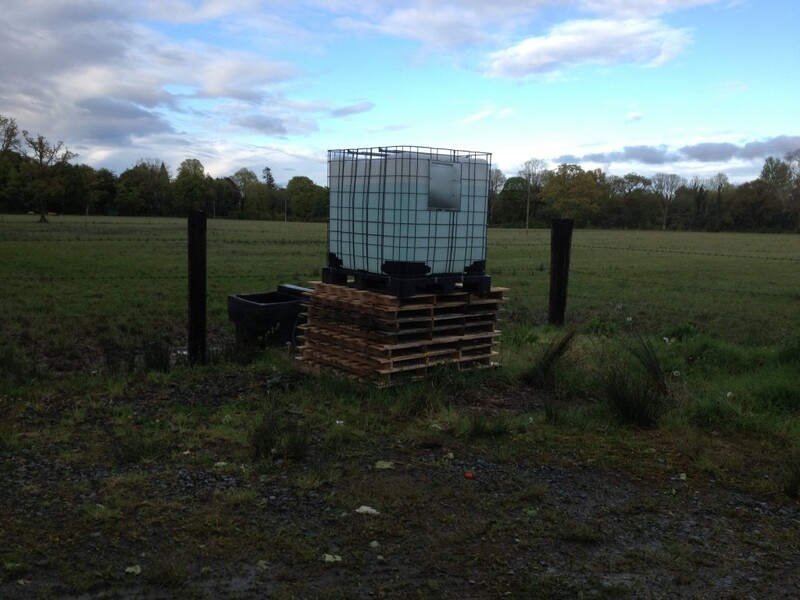 Pictured below is a standard 1000L IBC of hazardous material being stored with no bunding or warning to the danger of the product being stored. Quantity of product to be stored. Hazardous class of the product. Below is an 8 Pallet Firevault. 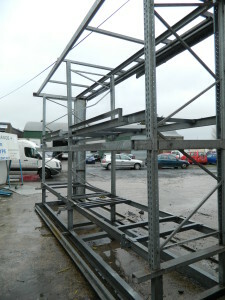 The framework is fully welded box section steel. The cladding used is a 1Hr fire rated panel. The bund is tested & certified with a capacity in excess of 110% of the largest container being stored. The twin sliding doors are running on a heavy duty henderson track system. The shelving is a parallel bar system which will accommodate both pallets and IBC’s. The vents and door seals are intumescent and are tested to 1Hr. The paint system is a 2 pack system which also provides corrosion resistance. 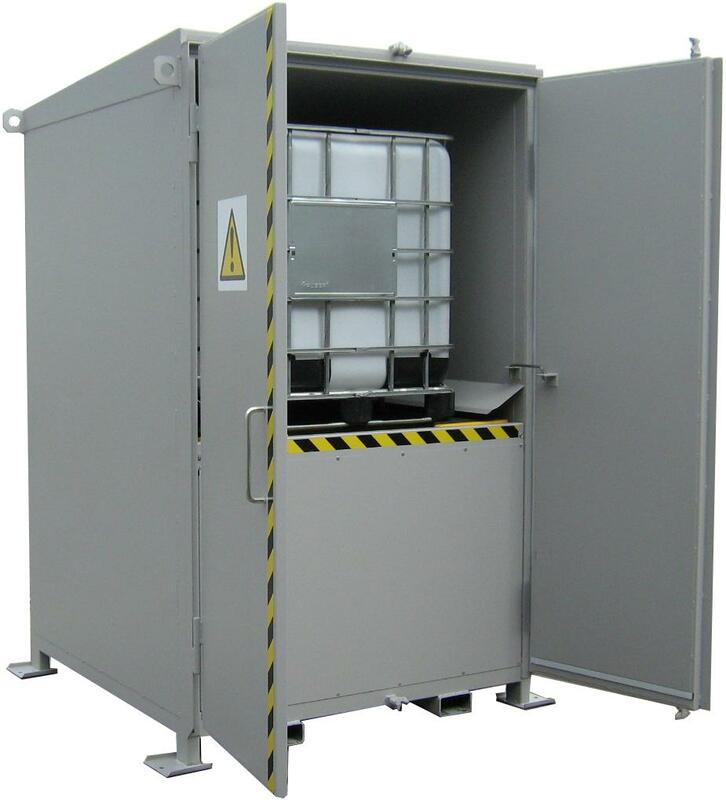 Pictured below is storage for a single IBC of hazardous material. The framework is fully welded box section steel with vandal proof steel cladding due to the location of the store. The bund of plastic construction is tested & certified with a capacity in excess of 110% of the largest container being stored. The twin hinged doors had openings of greater than 180° to easily load/unload the IBC. The shelving is a plastic grid decking which will accommodate both pallets and IBC’s. The paint system is a 2 pack system which also provides corrosion resistance.